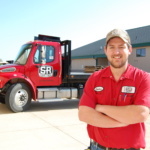 Contractors - Spahn & Rose Lumber Co.
We provide products & services that make it easier for contractors and builders to operate their businesses efficiently and profitably. Basically, we are your partner in business. With your next project coming up, big or small, we are here to help. Our goal is to guide you through your project because we want to make it as easy as possible for you. We offer in-house charge accounts at Spahn & Rose for select, valued contractors. With your in-house charge account, we also offer iNet Pro, our website featuring 24/7 access to your invoices, statements and bill pay! Outside salespersons to provide expert, jobsite service for your projects. Our job is to make your job easier. We provide tireless service to make it feel as if you have an extra member on your team! Let Spahn & Rose estimate your next project. We specialize in new construction, additions, commercial, agricultural, kitchen and bath cabinetry and more. With our design service that we offer, we will work together every step of the way to get your project rolling on time, on budget and to your exact specifications. From simple remodel plans to new construction, we have the construction plan and design service to get the job done right. Cabinets are our specialty. Your Spahn & Rose cabinet designer will help optimize, maximize & organize every valuable inch of your project, giving you a beautiful, functional space. Whether you’re looking for traditional, modern or rustic, we have the perfect mix of functional & fashionable options. Your Spahn & Rose designer will guide you through the entire process – from layouts to style choices, we will help create a space that is perfect for the homeowner. Stop in and check out our showroom remodels featuring the latest cabinet trends and displays. Get free delivery on qualified purchases! We have a fleet of trucks including boom trucks, drywall trucks, moffit trucks, flat bed trucks, and many more! We have the trucks to get your delivery to you on time, no matter where you are located. We have over 275 employees in 24 locations that are ready to help! 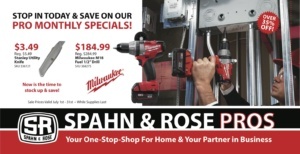 Here is the Spahn & Rose Pro Monthly Specials! If you would like to receive these via email, click on the button below to fill out the required information. Some services have terms associated with them. 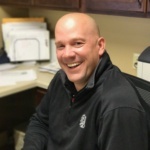 The best way to learn more about Spahn & Rose is to connect you with our professional service team led by one of our outside sales professionals. Fill out the form below and we’ll have someone reach out to you right away! We serve the following counties: Bremer County, Clayton County, Marshall County, Grundy County, Clinton County, Dubuque County, Buchanan County, Black Hawk County, Jasper County, Mitchell County, Fayette County, Marion County, Jones County, Howard County, Winneshiek County, Crawford County, and Cedar County in Iowa. In Illinois we serve Stephenson County, Jo Daviess County, and Ogle County. In Wisconsin we serve Crawford County. Whether your job is near by, or in a different town, we will be able to serve you!